As soon as I heard that Susan Khalje was coming to Melbourne, I signed up for the “Couture Sewing School” 6-day class, and the “Couture Techniques” 2-day class. The excitement built up and up, as I started thinking about what pattern to work on for the 6-day, and I managed to narrow my selection down to not one or two, but fourteen patterns! Some coats, some jackets, dresses – I had no idea what criteria to use to narrow my selection down to one! And anyway, what constitutes a “couture” pattern? What separates it from any other? And was it the actual pattern that is couture, or is it something else? 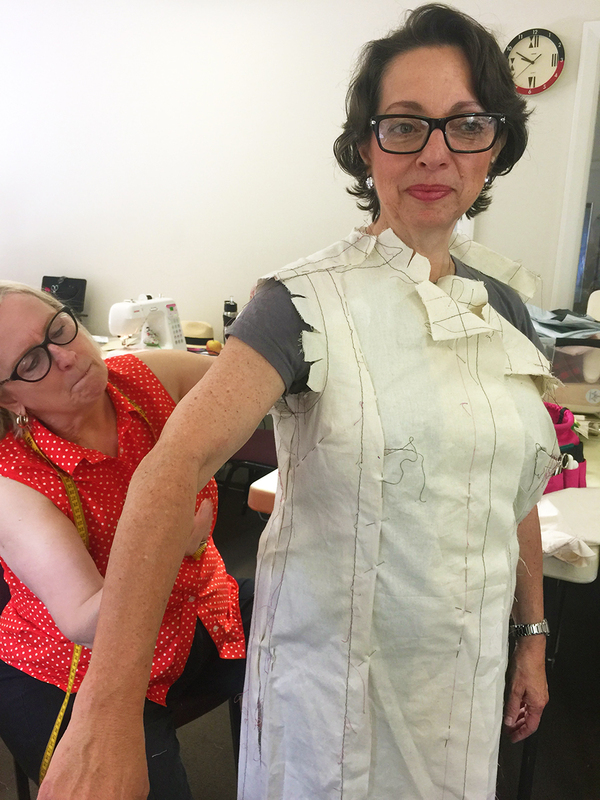 On the first day of class, I discovered more of the answer… According to Susan, it’s soft tailoring. When I read the blurb on Susan Khalje’s page about her Couture Sewing School, I got even more of a sense of it. 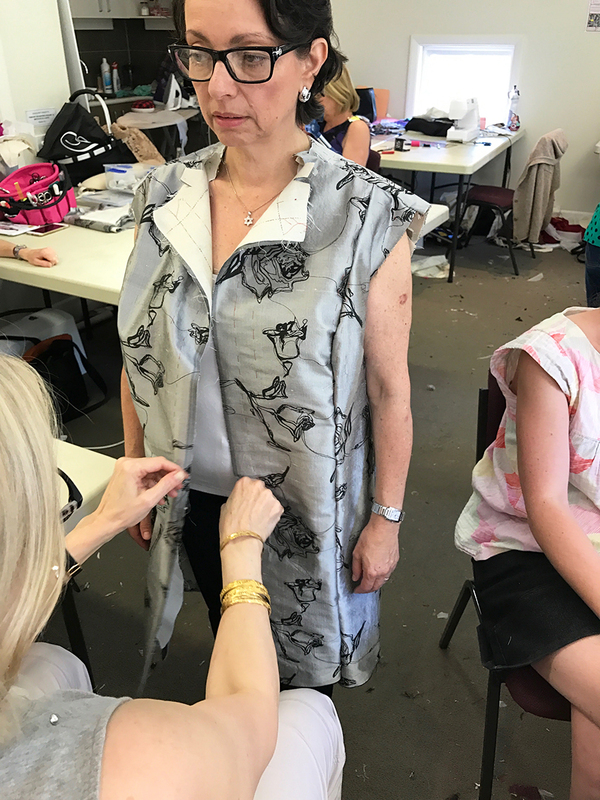 I think it’s about using techniques to fit, baste, embellish, and finish a garment, with heaps of hand-sewing, fine-tuning, and delicate approaches, and being willing to take the time to do it properly. It’s not about fast sewing, or how many garments you can make in the duration. It’s about honouring the process, and enjoying that ride, simply for the satisfaction and joy it brings with it. It’s the difference between an albeit beautifully tailored man’s suit jacket, and a softly structured, beautifully made Chanel bouclé cardigan jacket. Does that put you in the world of it? Now, before I continue to share my personal experience of being with Susan Khalje in her Melbourne Couture Sewing School, I want to tell you that I will refrain from giving specifics about her technique, or any of the details that are part of her brand and her name, as a matter of integrity. I will however recommend that you do whatever it takes to get yourself into her School, wherever in the world you can! So, let’s begin with my account of the most amazing week of sewing I’ve ever spent. After introducing ourselves, we began with our muslins, or toiles. If I ever had any thoughts about muslins not being really necessary, this week put an appropriately abrupt stop to that. I saw that it’s by working with the muslin, and only by doing that, can you get a properly fitted pattern that can be translated to the fashion fabric. 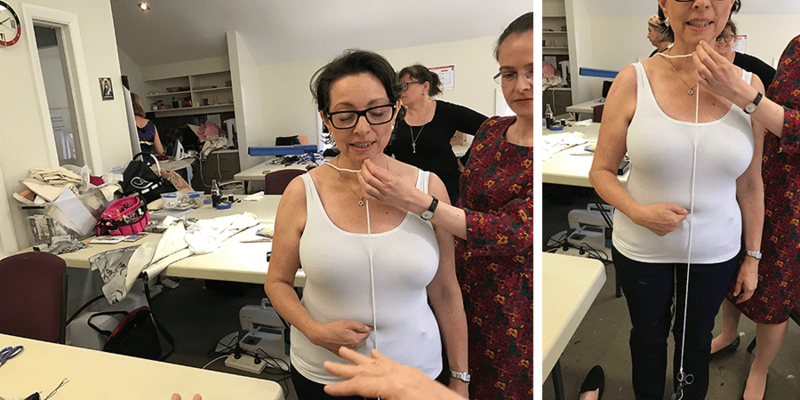 Susan is an absolute master at fitting. I’d finally settled on making the Butterick coat pattern by Lisette, B6383. After the first morning, we went fabric shopping, and I came back with nothing. I couldn’t find anything in my colours, and nothing that I liked, except for a beautiful jacquard that cost $165 per metre. I decided against it, and went home to have one more look through my stash, and came up with a beautiful piece of silk I’d picked up several years ago. Luckily, it was 2½ metres long! Perfect. All I needed then was some silk organza, and lining, and after seeing one of my classmate’s lining, I went straight to the shop, and bought the same for my coat. Wait till you see it! What I wasn’t prepared for was that it would take till around 4:30pm Thursday, almost the end of the 4th day of school, with just a little over 2 days left, before I could finally put my foot to the pedal and machine-stitch my coat pieces together. Susan said something to me that will stay with me a long time. She said that she’d asked one of the other teachers she knew what their goal was for their classes, what did she want her students to come away with. The response came back, she wanted her students to go away with a finished garment. Susan then said to me, “I want my students to go away with something that looks like I’d made it.” I smiled. I was in the right place, and with the right teacher. Susan had expressed the “want” I hadn’t before put words to, but was exactly what I’d come to this couture sewing school for. I knew that I was in the best hands, and as I relaxed, giving up my worries about finishing on time, I found I had a new appreciation for the process, and all the patience in the world for the work we were doing and the time it took, for what we wanted to accomplish. The fitting still wasn’t going so well. “Do we have a coat?” Susan asked? Yes, we finally had a coat. No sleeves, no collar, no buttonholes, nothing else other than a shell with underlining, but I could finally see a coat starting to take shape! It wasn’t until earlier on that 4th day that Susan had an “a-ha!” moment. She’d been working and reworking and undoing and moving seam lines for the past few days, trying to get rid of the swing-to-the-right that the right side of my coat was doing, despite all efforts to have it hang nice and straight. And finally, she spotted the problem. Using a very interesting test involving a pair of duckbilled scissors hanging at the end of a length of piping, and a wrapper of something that was folded and placed in between my legs, indicating the centre of my body, Susan discovered – and showed everyone – that one of my right shoulder is higher than the left, my right hip is higher and fuller than the left, and that the centre of my body, ie. where you’d expect the centre front lines on the two front pieces of my coat would meet, wasn’t anywhere near the centre of my body! You can see how off-centre my centre is in the above photos, right? Now, this was good news to Susan, as it finally explained why things hadn’t been working out right with her modifications. One of the greatest lessons I learned from Susan is that when something doesn’t fit right in some part of a garment, the thing to do is find the cause. The discovery of my body’s inconsistencies had to be resolved in the fitting of the coat, and that’s what she set about doing. After manipulating and tweaking, allowing more fabric for the right side at the hip, adding a shoulder pad to the left side, and hand-basting new stitch lines, Susan finally got the coat to sit properly on me. Oh happy days! By Saturday evening, at the end of the course, my coat was looking good. I had my sleeves nearly done, complete with gussets to enable freedom of movement, and the collar pinned in place. 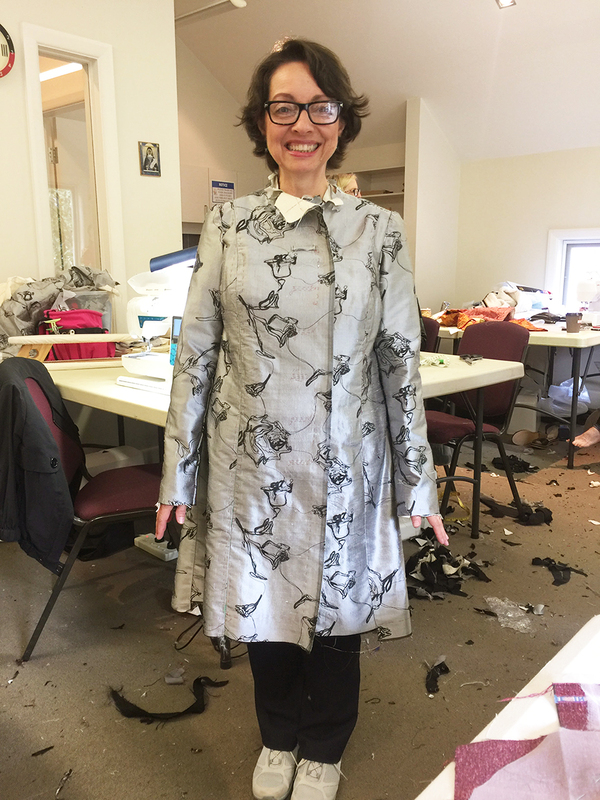 And, although I was terrified that I wouldn’t be able to finish my coat without Susan’s guidance, I left clear about the steps to take to sew this project to completion. Now, I must admit that each day since the course ended, I went to bed promising myself that I’d work on my coat the next day, put the second sleeve in, and I woke up every morning, resolved to sew. I really did. However, those confidence-draining demons kept getting the better of me, and bedtime would come round with not a single stitch done. Serious intervention was required! To sum up what I learned in the school? I don’t know that I can give you a list of everything, but I can say, without any hesitation, that my whole view of dressmaking is forever altered, and I now know that, with help to perfect fitting from one of my fellow classmates, the garments I will make from now on will be of a much higher standard than ever before. It’s so good to hear how you found the process and I can really appreciate the inability to keep moving on the coat… I’m off to the Brisbane one in two weeks and I haven’t even pulled the pattern out yet alone done the thread tracing ? I vow to get on to it… tomorrow ? Can’t wait to see your finished garment! Natasha, you’re going to love the class! It’s the best thing I’ve ever done in sewing. Enjoy 🙂 And good luck with the thread tracing! I did her Craftsy couture dress class a few years back so at least know what I am in for with the thread tracing!